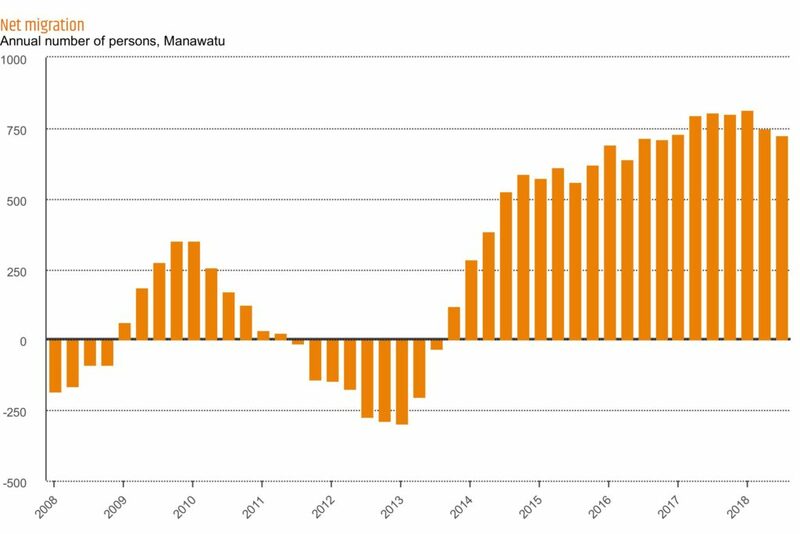 Manawatu is continuing to enjoy solid economic growth, underpinned by a strong primary sector, solid consumer spending and population growth, according to Infometrics. “High and sustained economic growth is expected over the next 10 to 15 years, supported by high levels of central government capital investments and businesses increasingly recognising the benefits of investing here,” says Palmerston North City Council Economic Policy Advisor, Peter Crawford. Projects such as the Manawatu Gorge Replacement Route (estimated to be worth $450-$500 million), the regional ring road, and more than 30 multi-million dollars’ worth of commercial and government construction and development projects, are just some of what’s ahead. Infometrics Quarterly Economic Monitor shows the region’s economy grew by 3.4 per cent, well ahead of the national average of 2.9 per cent, in the September 2018 quarter. High lamb and beef prices as well as favourable dairy supply conditions, strong global demand and a weaker New Zealand dollar have played a large role in this. The strong performance of the primary sector continues to boost the performance of the Manawatu district economy, which has grown faster than the national economy since September 2017. “Incomes are rising, people are employed and, as reflected in growth in retail spending and strong levels of investment, households and businesses are confident to spend and invest in the local economy,” says Manawatu District Council’s Economic Development Advisor, Stacey Bell. These favourable conditions are attracting new residents to the Manawatu region, with population estimated to have increased by 2,000 people or 1.6 per cent over the year to June 2018. School rolls have also grown strongly, with an additional 440 students enrolled in schools across the region compared with June 2017. This is an increase of 2.2 per cent over the year, far exceeding the national growth rate of 1.0 per cent and bucking the trend of declining rolls across much of the wider Manawatu-Whanganui region. Businesses across the city and district are in hiring mode and the region’s rate of growth in job ads is higher than the national average, according to ANZ job ads data. Recent Trade Me Jobs data shows job listings in Palmerston North were up by 19.3 per cent in the final quarter of 2018 compared to the year before, with the top sectors being accounting (up 115 per cent), manufacturing and operations (up 58.5 per cent) and education (up 31.1 per cent). In the district, listings were up 32.7 per cent in the same period, with the top sectors being construction and roading (up 214.3 per cent), transport and logistics (up 80 per cent), and trades and services (up 50 per cent). TradeMe declined to provide the exact number of listings. “We saw really phenomenal growth in job ads across the North Island in this quarter,” says TradeMe Jobs’ Anna Miles, describing the region as really positive for job hunters. Despite the number of jobs increasing, unemployment in the Manawatu region continues to creep higher and is above the New Zealand average, at 5.3 per cent and 4.3 per cent, respectively. Infometrics says there’s been a surprise increase in the average number of people receiving Job Seeker Support over the past six months, which is occurring against a backdrop of strong growth in employment demand. New construction projects such as the Food HQ building, BUPA retirement village, a new IRD office building and Toyota’s warehouse expansion have helped to send non-residential consent growth through the roof. In the September 2018 quarter non-residential consents were up 85 per cent, dwarfing the national growth rate of just under five percent. The Palmerston North City Council issued consents for 477 new houses in the year to December 2018, the highest number approved since the late 1970s. The council estimates it needs more than 460 new houses to be built each year, in line with its Long Term Plan to attract an extra 12,000 jobs to the city by 2028. Consents for new dwellings in the district also increased strongly to the year ended December 2018 with 199 approved. While this level of residential investment is heartening, construction of new dwellings still falls behind what is needed to keep up with population growth in the Manawatu district. The Infometrics report shows high business confidence is taking commercial vehicle registrations to extraordinary highs, growing 12 per cent in the year to September 2018, ahead of the 2.3 per cent national average. Continued growth in consumer spending reflects strong confidence among locals and their view of the economy. 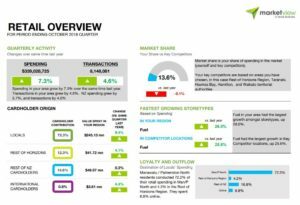 The latest MarketView Manawatu Spending Quarterly Report shows spending in the October quarter grew by more than seven per cent to $339 million. Spending in Palmerston North’s outer CBD rose by 13 per cent, helped by the new Hunting and Fishing Store in Grey Street and the new Torpedo7 outlet store, according to Peter Crawford. 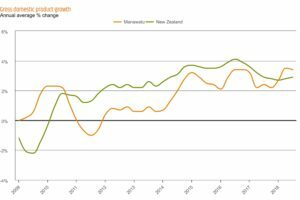 Manawatu is one of several regions around the country where the rate of economic growth is far exceeding New Zealand’s major cities and current conditions show there’s no signs of slowing. Please find the full reports, below.